In the wedding planning process I spent endless hours browsing Pinterest and doing DIYs to ensure we had all the personal touches that would make the venue and decor very us. Our wedding colour scheme was pink and rose gold. 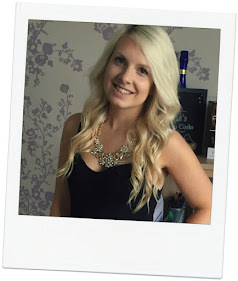 This featured in all of our stationery, which I designed and made, then in our bridal party outfits and the flowers. We had a glitz and glam theme running throughout which came from my love of all things glitter. 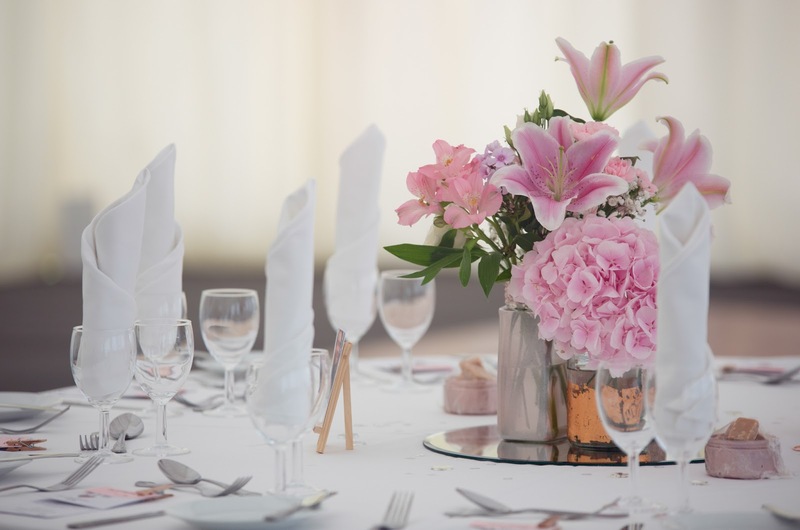 This inspired lots of the wedding decor which were dotted throughout the marquee and hall. 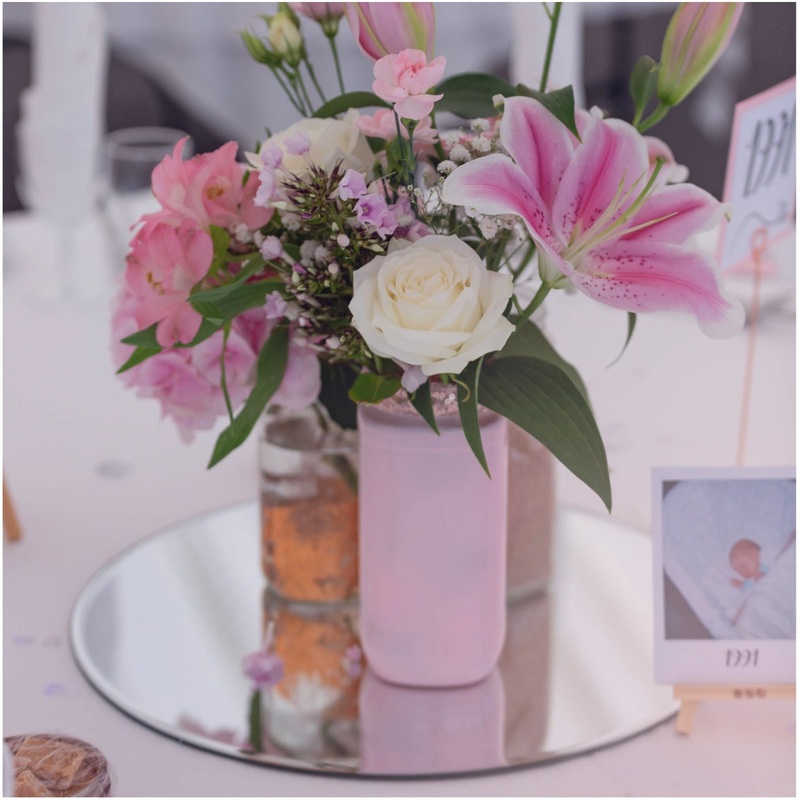 Our photographer captured lots of the personal touches just perfectly so whether you're planning a pink theme, a magpie like me or are looking for ways to make your wedding more personal hopefully you can get some ideas here. 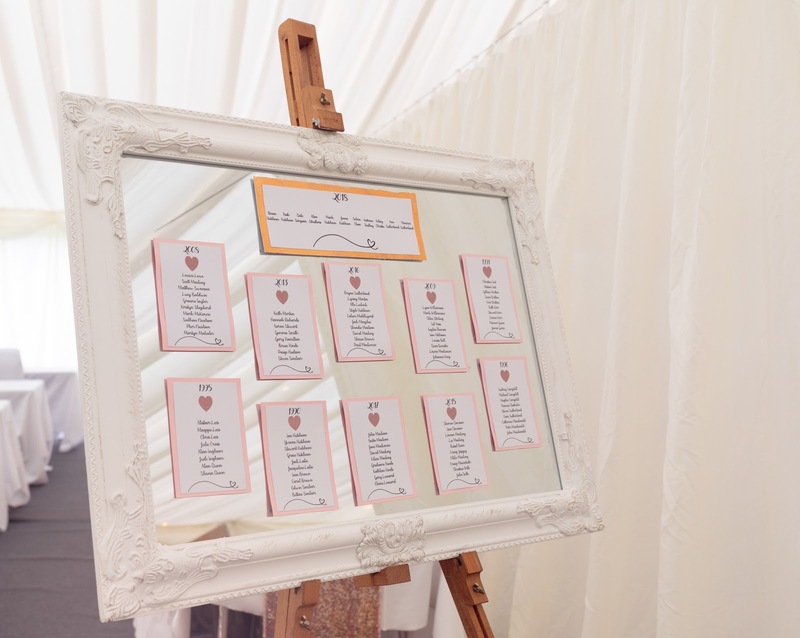 Our seating plan was on display on an ornate style mirror. Our table names were all years special to us and our story. We had years like 1990 and 1991 with baby photos which were perfect for our family's tables, and 1995 and 1996 with school photos too. Then we marked the years we met, graduated, bought our house and got engaged up to 2018 for the top table. Each table had mini easels and a photo from that year as well as a rose gold number holder stand. The pink card and cursive font on the table plan all matched our wedding invites, along with the rose gold foil and glitter heart stickers. 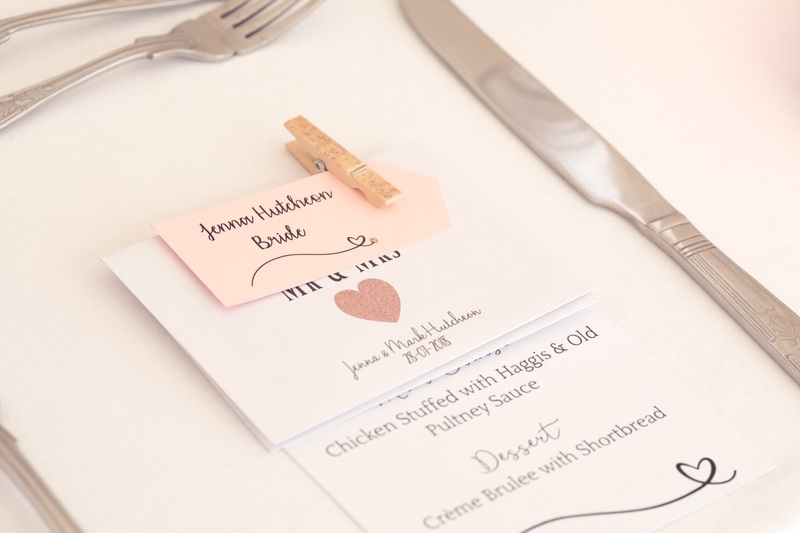 I continued this for the place settings with our favours being scratch cards in a 'Love and Riches with the new Mr and Mrs' envelope, our wedding meal menus as chosen by each guest and a name card held together with a peg painted in rose gold nail polish. Along with the table numbers and photos we had the most gorgeous flowers in some DIY jars. A lot of the time when people think DIY jars for a wedding it's the rustic look with twine and brown paper but not me. On the months leading up to the wedding I spray painted, foiled and glittered somewhere from 80-100 jars of all different sizes. I used rose gold, copper and light pink spray paint. I also use spray glue and rose gold and pink glitter then also rose gold foil sheets like on our wedding invites. This mixture of colours and textures were then group together for each table. We also had mini jars which had tablet as a sweet treat after dinner. 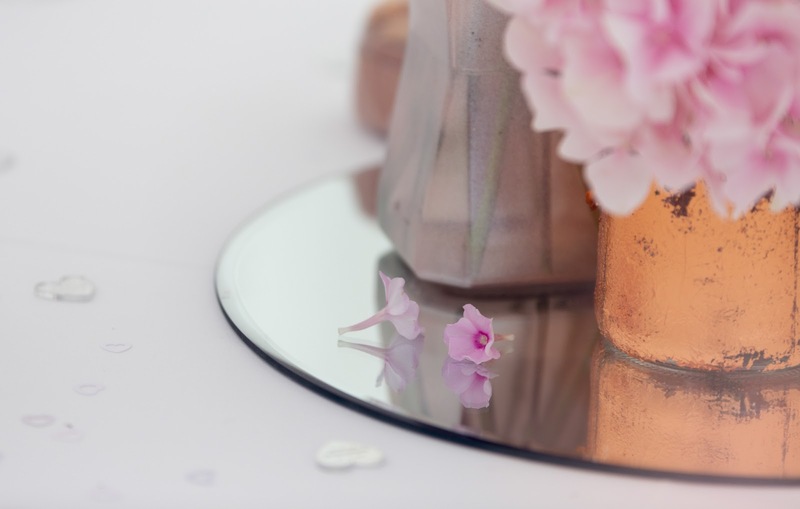 The jars and flowers were the centrepieces on our tables on top of mirror plates. Also on the table we had personalised mirror hearts which said our names and wedding date. My uncle made our bar for inside the marquee and it was absolutely amazing . We wanted to decorate it to keep the theme and some fairy lights were perfect for that. 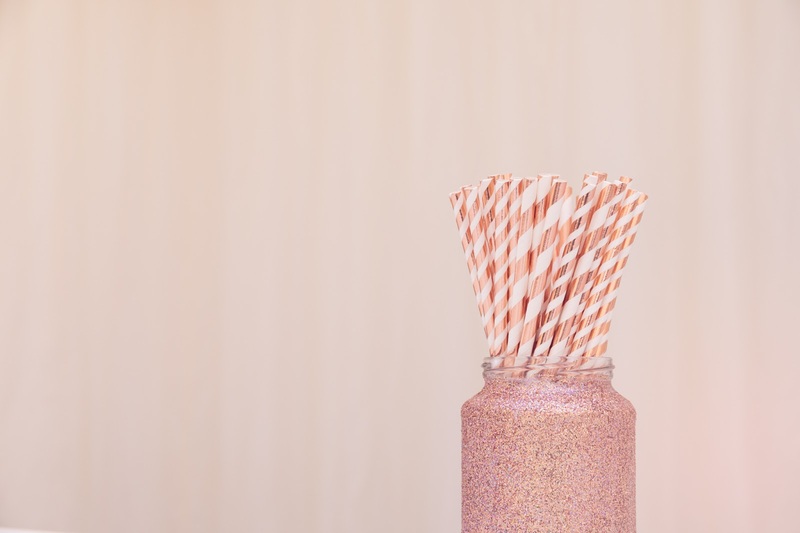 On top I used one of the rose gold glittered jars to hold our rose gold paper straws. 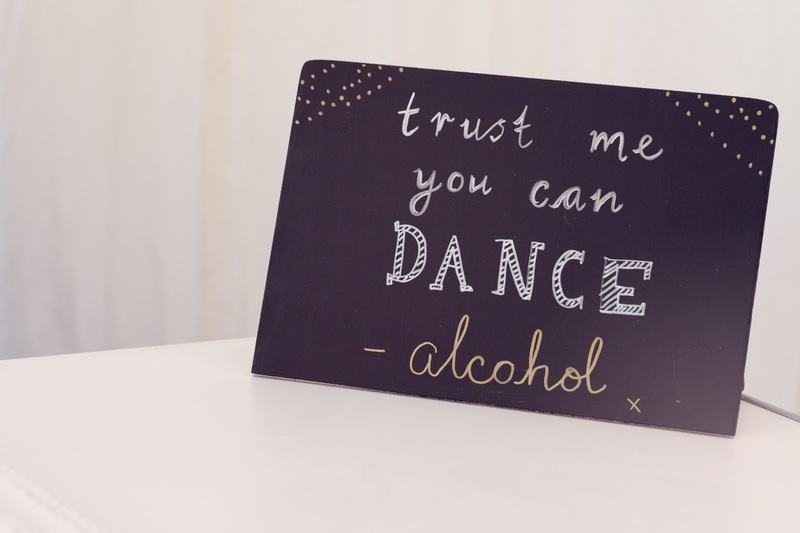 I also made a couple of chalkboard signs with little alcohol related quotes. One said 'Trust me you can dance -alcohol' and the other said ' The hangover lasts a day but the memories last a lifetime'. Onto the sweet treats! We didn't go for a regular old wedding cake. As we're both cheesecake connoisseurs we opted for a 3 tier cheesecake wedding cake. We had white chocolate and berries with edible glitter, chocolate and Baileys and lastly salted caramel. 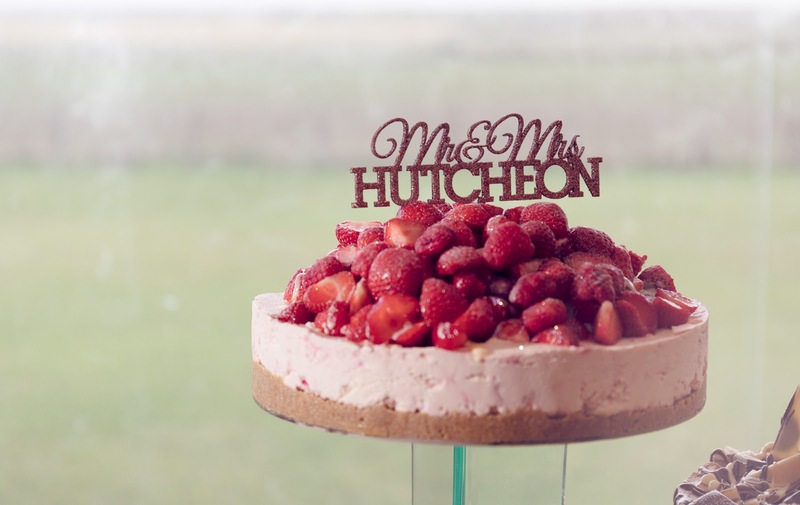 They looked absolutely stunning and were perfectly topped off with our personalised cake topper. 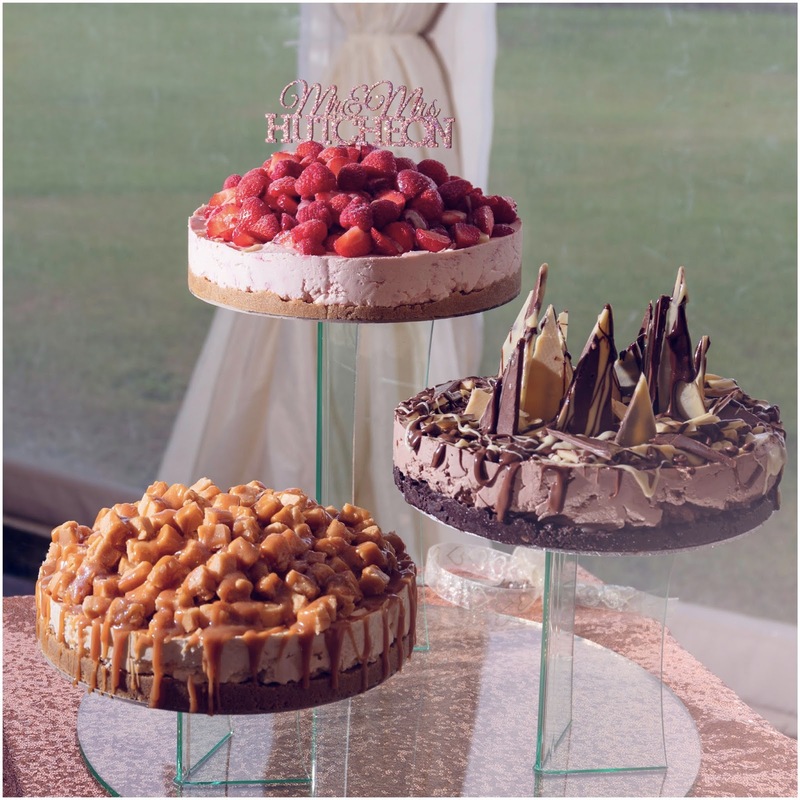 These cakes were over the top and so brilliantly designed but not the most easy to serve on the night so we had mini cheesecakes with spoons as part of our buffet. This also meant we got to keep the real things for the day after the wedding and served them at our post wedding BBQ and drinks. Like so many other people we had a sweetie table. We weren't going to as we had no children at the wedding but really it's great for the big kids and especially popular after a few drinks! 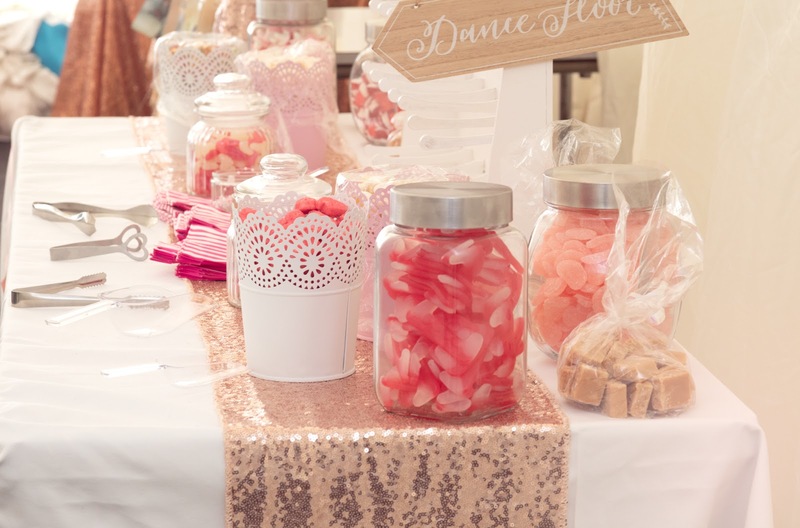 We bought a variety of storage jars and clip lid jars and kept up the pink theme with most of the sweeties, adding in a few of our favourites too. The paper bags and scoops were all really cheap from Wish. 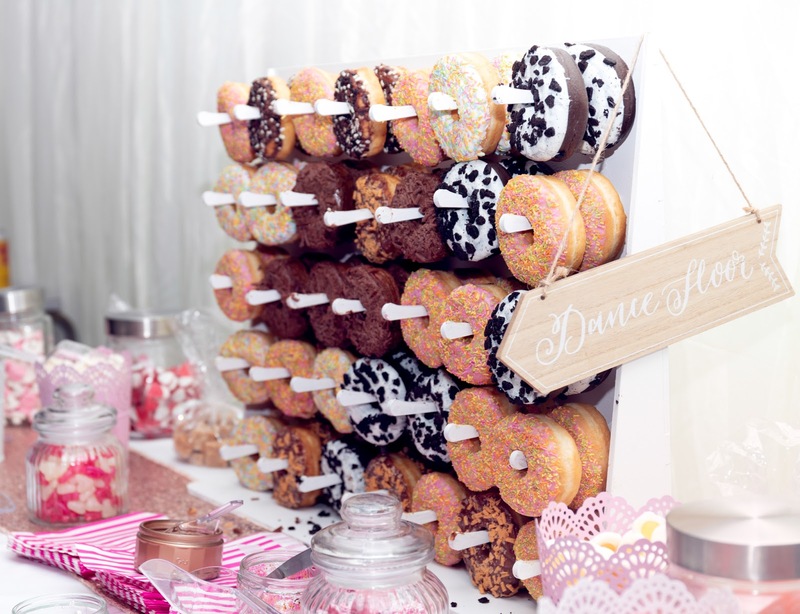 Another sweet treat that I was quite excited for is the popular donut wall. We hired the wooden board with pegs locally then bought a selection of donuts from Tesco. This kept everybody going when the hangovers kicked in on the Sunday too! You can also see one of the Ginger Ray wedding signs which were dotted about our venue. 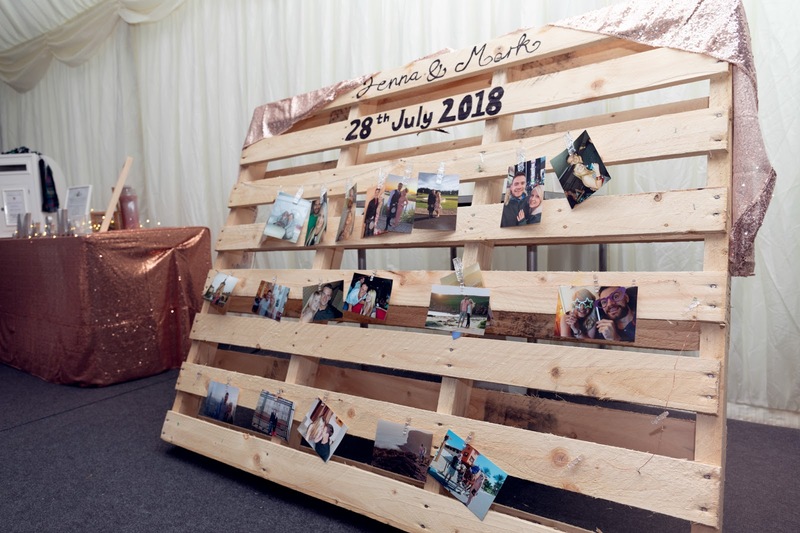 Along with the photos on the tables we also had a wooden pallet which I sanded down, wrote our names and wedding date and decorated with rose gold glitter table runners and fairy lights. This had photos from our 10 years together and it was nice for our guests to reminisce with us and celebrate our journey. After the wedding we removed the photos and replaced the fairy lights for solar lights and it lives in our garden! Another DIY but this time from my Grandad. 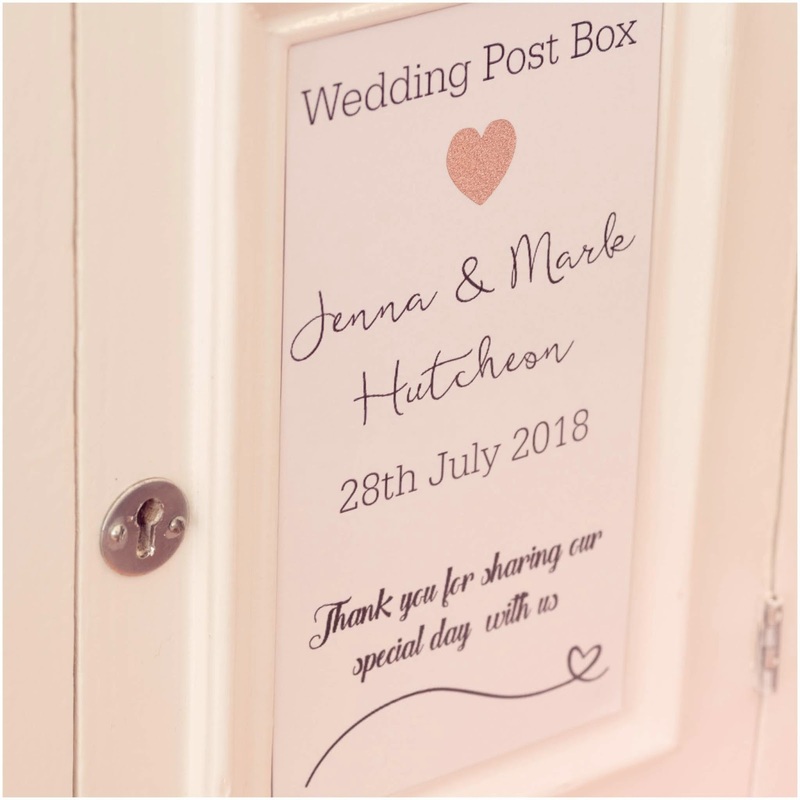 He made us a postbox to allow our guests to deliver any wedding cards safely on the day. The postbox is absolutely amazing and hard to believe that it was handmade. It had a little space on the front for a sign so I made one that matched our stationery. It sat pride of place on top of a rose gold glitter table cloth with our hand-fasting cords and wooden heart guestbook.